Updated September 26, 2018 — This article has been updated to include more producers. See at bottom. —DJ Over many years, you have found LSA market share information on this website. Many have found this of interest …from businesses learning more about their market; to customers doing careful investigation before paying tens or hundreds of thousands of dollars for a new aircraft; to government fulfilling its task of regulating industry; to insurance companies assessing risk of providing their product; and many other actors in the blockbuster movie that is light, recreational aviation. 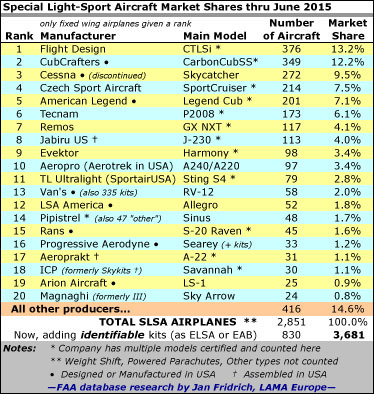 I will have more to say about the broader LSA market share reports below but now I want to present the best information I have seen for Light-Sport Aircraft Gyroplanes. …uh, except for one problem. No such aircraft category exists, SLSA gyroplanes, that is. 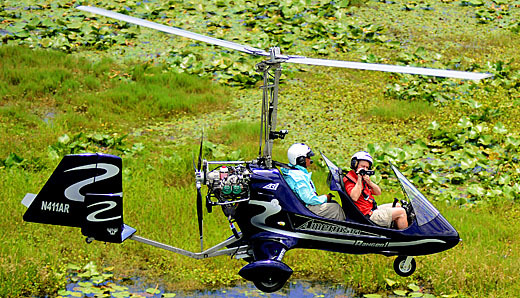 FAA has denied fully-built Special LSA status to rotary winged aircraft such as gyroplanes. LAMA thought this was on track for a solution as recently as two months ago (see report), but today, the matter is back in doubt, truly a shame as these aircraft are thriving around the world. 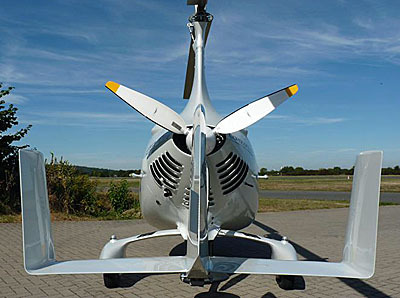 Rotax has reported for some time that they sell more 9-series engines to gyroplanes as a specific category than to other groups. 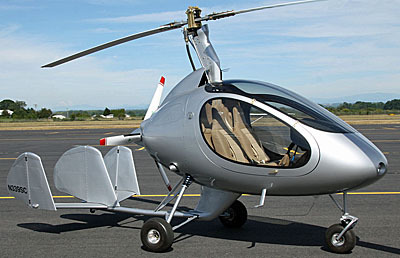 Indeed, sellers like Germany's AutoGyro have more than 2,500 units flying. 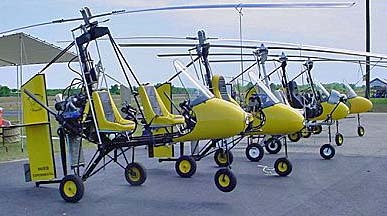 FAA's rotorcraft personnel are living in the past, remembering the problems of early machines like the Bensen Gyrocopter. Before training and before design evolution, those aircraft did have a undesirable safety record. However, that has been remedied… long ago, actually. Our new associate, Steve Beste, wrote an excellent article for his club newsletter and I will summarize that piece in another post. In his article, he wrote, "[Along with better training] the other change since those days is the large horizontal stabilizer, mounted well aft. Some machines were prone to PIO, pilot-induced oscillations in pitch. The pilot would chase the oscillations, only making them worse until the gyro did a fatal bunt over. The large tail that Magni invented – as is used on all modern gyros – has fixed that." "I'm a retired computer guy and trike pilot who loves databases," Steve told me. He used his special set of skills to download FAA's aircraft registration database to compile statistics on gyroplane registrations, focused on the new European-style gyroplanes. As you can see, AutoGyro is the clear market leader at 52% with 163 aircraft of 312 gyroplanes registered with FAA. The German builder is trailed by Magni in the #2 slot at 18% with 56 registrations. A new American manufacturer, SilverLight Aviation, has quickly tied Spanish producer ELA for third at 8% with 26 aircraft registered for each. After that it trails off more quickly as Steve's chart shows. More details about other brands will be chronicled in an article to follow. For 2018 through July 23rd, Magni shows its strength by slightly beating AutoGyro U.S. registrations. As always, note that confirmed sales and registrations may not match precisely. In addition, much more of 2018 remains. In slightly more than half a year, gyroplanes registered 58 aircraft putting them on track to exceed 100 for the year. To offer perspective, this figure is approaching half as many as SLSA fixed wing registrations in recent full years. So far this year, Magni has 15 registrations to AutoGyro's 14 for 26% and 24% shares totaling half of total U.S. gyroplane registrations. SilverLight has registered 8 aircraft in 2018 for a 14% yearly share of 2018 to date. A less well recognized U.S. producer, Tango, is having a respectable year, with 9 registrations accounting for 16% in 2018 so far. Tango is trailed by ELA with 6 registrations (10%), Australia's Titanium and Italy's Brako tied at 3 for 5% each. 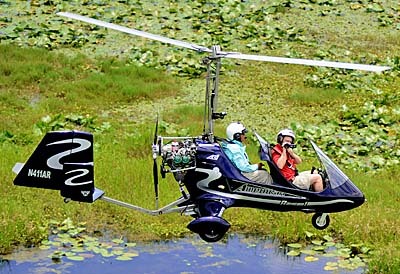 One interesting point: only Tango and Brako offer a single place gyroplane; all others are two place machines. Much More Data to Follow! Steve Beste and I have been discussing him providing database research to allow this website to continue providing LSA Market Share Info. Many visitors have written to ask; indeed, we are way behind on this effort. The delay is ending. After Steve gets time to study the previous work and methods, he has proposed some wonderful improvements. About the special skills he can offer, Steve wrote, "I'm a retired computer guy and trike pilot who loves databases." Well, that certainly sounds perfect to me. "I'm also the president of Flying Club 1, which was the original USUA Chapter 1," Steve added. "Regarding the FAA database, I'd very much like to reach beyond just [fixed wing] airplanes, partly because I'm a trike pilot, myself. I think that's entirely possible." Given this background, his obvious enthusiasm for this work, and the keen interest of many in light aviation, I am exceedingly pleased to welcome Steve to this website. "[However, FAA's] data is not clean," Steve observed. I am well aware of this problem. Uncertainty about data accuracy of "alternative" LSA is why we have reported fixed wing Special LSA, only offering guesses for weight shift trikes, powered parachutes, gyroplanes, motorgliders, and more. However, we hope that will now change and our market share reporting will be more inclusive. Hurray! Problems in FAA's database is not caused by incompetent clerks. Agency personnel must sort through inconsistently-reported aircraft. If, as Steve pointed out in one example, the registered name of the aircraft is slightly different, it won't show up on a casual investigation. He added, "There's no end of that kind of thing …just so we know the limitations on this exercise. But with that understanding, I love this kind of thing, I have the skills to do it, and would be honored to support your good work for the sport." All such reporting will be available on the home page when fresh and catalogued on its own space found by this link. Wonderful, simply wonderful! Please welcome Steve Beste as a new contributor to ByDanJohnson.com! UPDATE September 26, 2018 — In the article above, I inadvertently suggested SilverLight and their American Ranger gyroplane was the first or only U.S. producer of such aircraft. That is not what I intended but some readers viewed it that way. Allow me to bring your attention to two other producers. 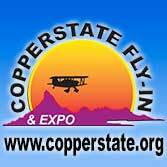 Based in Oregon, Sport Copter is a long established, second-generation family business started in 1958. Chuck Vanek was one of the early pioneers of gyroplane design and development beginning his work in 1957. 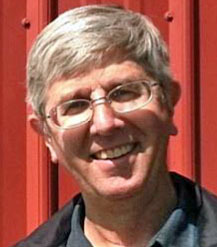 Chuck's son Jim Vanek took over the business and revamped the Vancraft designs. He said his "award-winning, world’s-first, two-place gyroplane took the prestigious Charles Lindbergh award at the Oshkosh airshow in 1985." 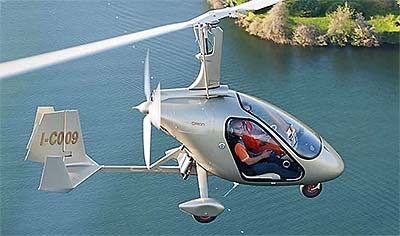 The company also reports his Sport Copter II design was voted as one of the Top Ten Best Designs at AirVenture in 2011. 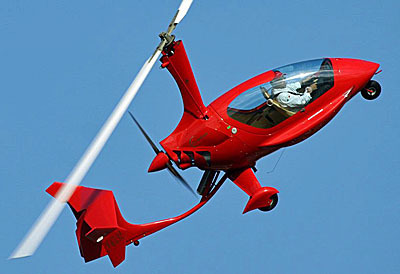 An airshow performer, Jim said he wrote the parameters and guidelines for gyroplane looping for the FAA in 1998 after performing the world’s first loop in a conventional gyroplane, in 1997. The company's website reports, "He is the only gyro pilot in the world that holds an International Council of Air Shows card for gyroplane looping and rolling." Don't even think about trying this yourself, however. Rotor Flight Dynamics, founded and run by Ernie Boyette, produces a two place and single variations of their Dominator line. Sold as kit aircraft, the two-place model can be powered by Hirth four-cylinder engines, Subaru/AutoFlight EA-81, or the 115-horsepower Rotax 914 Turbo. The company said, "We offer 22 thru 28 foot rotor blades of our own design with a lift capability from ultralight thru 1,200 pounds gross weight." They added, "We are the only manufacturer that test flies all blade sets prior to shipping." For export, Rotor Flight will fully build their aircraft but in the USA, FAA will only permit them to deliver kits, the same as all gyroplane producers. As with all the modern gyroplanes, Rotor Flight uses a substantial tailplane. "The Dominator [series of one and two-place machines] incorporate the Tall Tail design for stability." Asked how their product differs, the company's website states, "What makes the Dominator so unique is its high profile design. It sits up very high off the ground." Updated September 26, 2018 — This article has been updated to include more producers. See at bottom. —DJ Over many years, you have found LSA market share information on this website. Many have found this of interest …from businesses learning more about their market; to customers doing careful investigation before paying tens or hundreds of thousands of dollars for a new aircraft; to government fulfilling its task of regulating industry; to insurance companies assessing risk of providing their product; and many other actors in the blockbuster movie that is light, recreational aviation. I will have more to say about the broader LSA market share reports below but now I want to present the best information I have seen for Light-Sport Aircraft Gyroplanes. …uh, except for one problem. No such aircraft category exists, SLSA gyroplanes, that is. FAA has denied fully-built Special LSA status to rotary winged aircraft such as gyroplanes. A dozen years after FAA created aviation's newest sector, we have a new leader among manufacturers of fully built Light-Sport Aircraft. CubCrafters has been moving upward with several years hitting 50 deliveries. In 2016 the west coast builder finally topped perennial leader Flight Design, which slipped to second place. The CT builder had occupied the #1 position since the beginning of Light-Sport Aircraft. Only four aircraft separate the two brands. Note: this article has been updated twice; see at end. —DJ In the single-year race, Czech Sport Aircraft won convincingly with almost double the next closest producer. The Czech builder performed well in 2015 but significantly increased last year. Congratulations to both companies. Our well-known SLSA Market Share chart illustrates the size of the entire fleet since the beginning of the newest category. To explain further, our "whole fleet" market share chart — the one we have published going back to 2006 — keeps track of all Special LSA (SLSA) airplanes in the U.S. fleet. Regretfully, we are unable to properly account for weight shift trikes, powered parachutes, gyroplanes, or motorgliders because the database is too variable. This does not mean to criticize FAA data entry clerks; for example, how should they list a trike that uses a different ASTM-compliant wing? Does it deserve a different model name? Also, gyroplanes must be sold as kits in the USA (for now) even while fully built models are selling strongly overseas. We believe all the sub-categories of LSA could increase the fleet count by an additional 25% but we only show fixed wing airplanes in our chart. Likewise, we give a small reference to Experimental LSA (ELSA) when we can account for them with good accuracy. 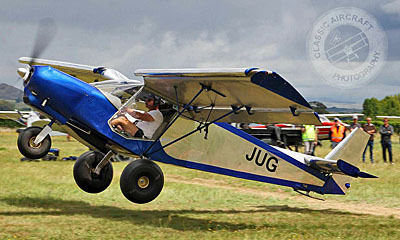 Finally, many two-place ultralights converted to ELSA before 2010 are not counted. 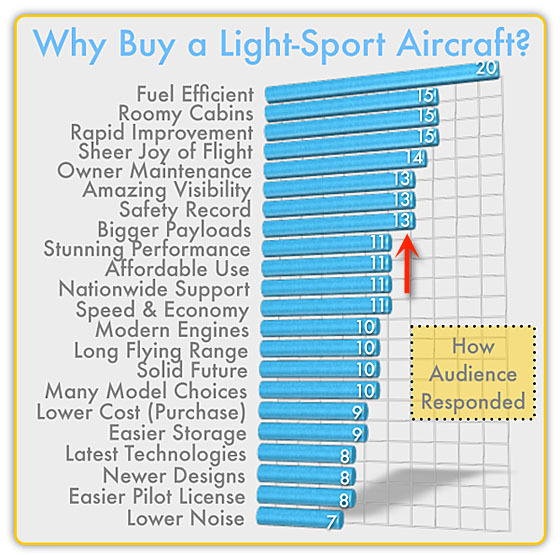 Add all these types and the U.S. market for LSA or LSA-like aircraft probably exceeds 10,000 flying machines and even that does not include ultralights. For more on this accounting dilemma read this article or this one (see chart at end). The numbers come directly from FAA's registration (N-number) database. 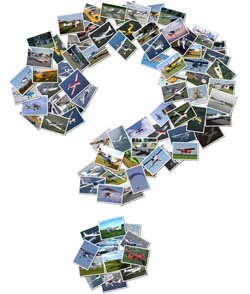 Besides the difficulty for FAA to correctly identify many makes and models, mistakes or changes happen. Entry errors can occur. Airplanes may be sold out of the USA. Mishaps can remove an aircraft from the database. These possibilities can cause our numbers not to identically match what a producer may show as American sales. Despite these disclaimers, we know our information is the best available and we work hard to assure the most accurate information we can find. For this effort, I am deeply grateful to LAMA Europe director, Jan Fridrich, who has faithfully maintained this information for more than a decade. Jan expertly does this tedious database work even as his job with the Czech Light Aircraft Association has taken him to China nearly two dozen times in the last couple years as he and his nation attempt to help China grow its recreational aircraft community. After producing the fleet chart for several years, people wanted to know how various companies had done only in the last year. For the last few years, we have broken out these figures in our calendar chart. Of course, this list faces he same challenges and our numbers may not exactly agree with what producer records show. Over time, both charts tend to get closer. We have and will continue to omit some brands from our Top-20 market share ranking if the supplying company leaves the business and no one absorbs their production. For example, Cessna has nearly 300 examples flying in America. However, since you can no longer buy a new one, even this famous brand may one day be dropped from the list. Besides the leaders, the Top-5 brands remained steady with CubCrafters, Flight Design, Czech Sport Aircraft, American Legend, and Tecnam holding their highest rankings. Our newer Calendar-Year SLSA Market Share table reveals which companies had the strongest performances in 2016. Jabiru moved up one notch, while Remos slipped one. Aerotrek (another year-after-year gainer) climbed another rank while Evektor fell one. Nonetheless the top five, these last four, and Cessna are the only brands breaking into triple digits. 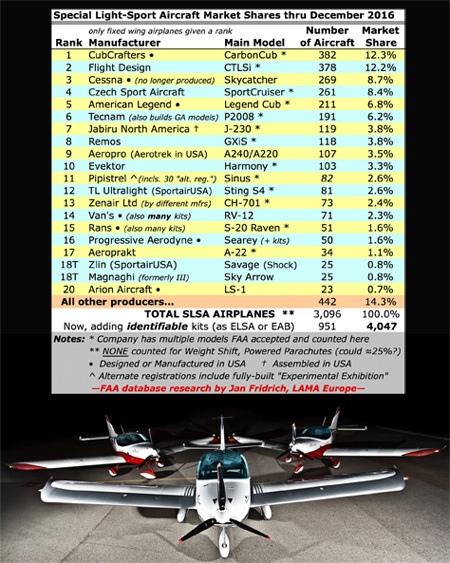 Although Pipistrel gives us challenges to count (some are registered as Experimental Exhibition), the Slovenian company has also exhibited an even climb and now ranks 11th in the fleet or 3rd for calendar 2016. 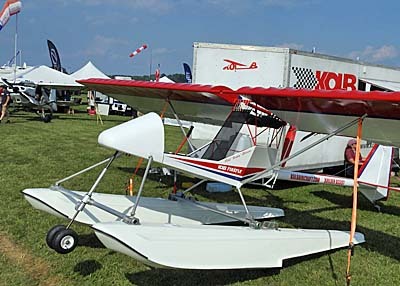 One fooler is SportairUSA, which markets both TL Ultralights and Zlin. Neither has broken 100 yet but when combined SportairUSA has and that's before fresh excitement over their new Outback Shock. Van's continues to make more fully built RV-12s with their partner Synergy Air. Progressive Aerodyne, builder of the Searey approved in both USA and China, has had and still boasts solid years. The central Florida company is the clear leader in LSA seaplanes even while Icon's A5 finally began to show up with 13 new registrations in 2016. Finally, while our main chart focuses on the top brands, note that the largest single percentage are registrations from “All other producers.” The same is true in our calendar year chart. Sometimes called "boutique brands," these companies continue to find customers. Even as Light-Sport Aircraft matures as a niche in the aviation industry, its promise remains strong. 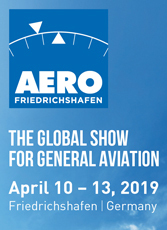 As our ongoing reporting from Aero and Sun 'n Fun shows, new models continue to be developed and governments in more countries are embracing the ASTM standards to approve these aircraft. No wonder the general aviation world wants what LSA has. 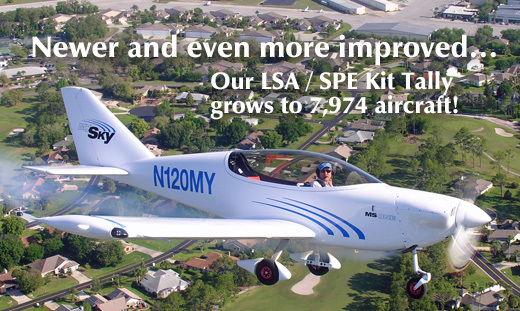 Unlike legacy aircraft producers — those making general aircraft that have changed little over half a century — the LSA space continues to supply interesting, innovative, modestly priced, good performing, superbly equipped, and yes! …safe aircraft. Now that most manufacturers have seen BasicMed has not materially affected their business the American LSA segment grows steadily while worldwide sales continue to eclipse new GA single engine piston deliveries by multiple times. Update #1 — May 1, 2017: After this article was posted, Pete Krotje of Jabiru North America wrote, "Your 2016 LSA chart shows Jabiru North America with five units last year. The number is actually seven (N733Y, N766J, N768J, N72TA, N773J, N218KC, and N772J (a J170-D)." We love when vendors aid our effort to achieve accuracy. This information was shared with Jan Fridrich. Update #2 — May 2, 2017: After Tecnam's U.S. base got a number of calls about this article, we exchanged email about the process. While we can only reliably count FAA registrations and these numbers may not precisely match a seller's data, Tecnam USA observed, "FAA registers us in different ways. Sometimes just Tecnam, sometimes Costruzioni Aeronautiche Tecnam, and sometimes Tecnam SRL C.A. So that might be why not all the Tecnams sold were included." Their sales records show the following 17 SLSA were sold in 2016: 7 Astore models, 8 P2008s, and 2 P92s. Thanks to Tecnam for sharing this and again, we forwarded the numbers to Jan.
A dozen years after FAA created aviation’s newest sector, we have a new leader among manufacturers of fully built Light-Sport Aircraft. CubCrafters has been moving upward with several years hitting 50 deliveries. In 2016 the west coast builder finally topped perennial leader Flight Design, which slipped to second place. The CT builder had occupied the #1 position since the beginning of Light-Sport Aircraft. Only four aircraft separate the two brands. Note: this article has been updated twice; see at end. —DJ In the single-year race, Czech Sport Aircraft won convincingly with almost double the next closest producer. The Czech builder performed well in 2015 but significantly increased last year. Congratulations to both companies. 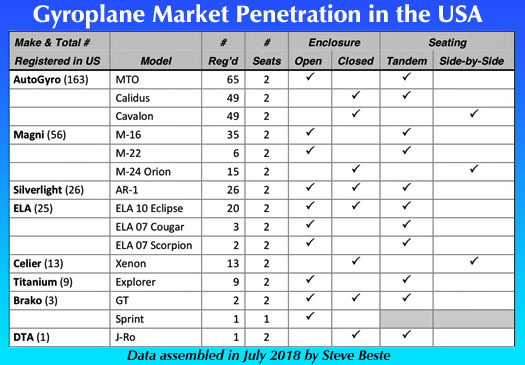 To explain further, our “whole fleet” market share chart — the one we have published going back to 2006 — keeps track of all Special LSA (SLSA) airplanes in the U.S. fleet. Regretfully, we are unable to properly account for weight shift trikes, powered parachutes, gyroplanes, or motorgliders because the database is too variable. Updated 4/26/16 - This chart was updated to correct a formula error. The changed line refers to the "All other producers..." figure. It was 429 airplanes and 14.7% and that was incorrect. 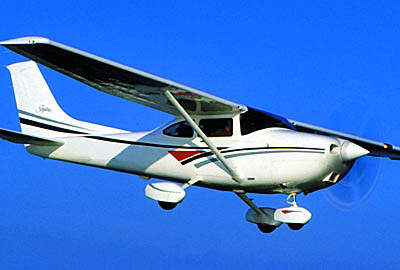 SportCruiser by Czech Sport Aircraft, sold in the USA by U.S. Sport Aircraft, moved up again with a solid 2015. While repeating another respectable year of SLSA sales (in addition to their kit sales), Searey may have become the best-selling LSA in China. Article Updated 8/8/16 — The second chart appearing below for Calendar 2015 results had errors in the spreadsheet formula. They have been corrected below. —DJ My associate in Europe, Jan Fridrich of LAMA Europe, has been the source for a database search for many years as I seek to report market share statistics in the USA. He scours the FAA registration information and laboriously assembles the numbers. As he and I work to produce accurate info, Jan often makes contact with selected companies when questions arise, as they often do. I also reach out to producers in our effort to make the best possible use of the registration data to create our rankings. Jan has been one of his country's representatives in the Czech Republic's official work with the Chinese to help that nation build its lighter aviation infrastructure. He's made many trips to China in the last two years. Along with frequent travel in his job for the Light Aircraft Association time is short for him to find the hours it takes to review FAA's data. For 2015 data, he completed the effort as I headed to Sun 'n Fun and then to Aero, so... finally, here is our report with hearty thanks to Jan for doing this tedious work. The summary view is that American LSA registrations have remained very consistent over the last three years (2013, 2014, and 2105). Most industry players believe we should be seeing higher figures but the LSA results closely mirror trends reported by GAMA for type certified aircraft. Likely reasons for lower numbers may include pilots still uncertain what will happen with the medical and a large fleet of still airworthy though increasingly older used aircraft — the average age of which is around 38 years — that are available at lower cost than a new Light-Sport Aircraft. Since I am in Europe as this is written, I can pass along that several Europeans see a similar picture here, albeit without the medical issue. As 2016 began, America had just shy of 3,000 LSA airplanes in the registry. As we've said for years, this figure does not include weight shift aircraft, powered parachutes, motorgliders, or gyroplanes, which, if they could be accurately counted, would conservatively add 20%. Also, the figure also does not count many ELSA and should not count Experimental Amateur Built even if those aircraft are nearly identical to Special LSA. See this 2014 article for an effort to give a more accurate total of the LSA, LSA-like aircraft, and Sport Pilot-eligible aircraft operating in the United States. Our main fleet chart above reflects all SLSA airplanes ever sold in the USA, less any that have been removed from the registry, for example, if sold outside the USA or lost in an accident. As you can see, CubCrafters continues their climb and is now hovering just below Flight Design. 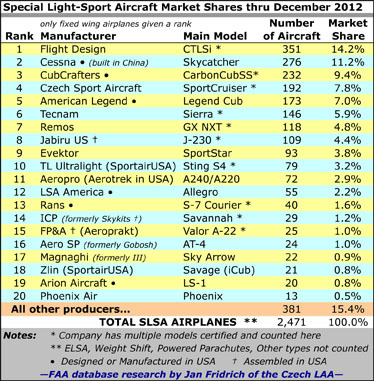 Czech Sport Aircraft, American Legend, and Tecnam continue their growth making up the top five names. 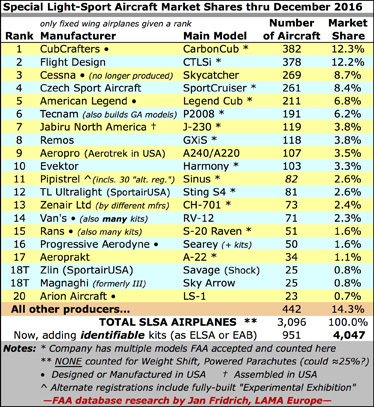 We leave Cessna on the chart for now but most readers know Skycatchers are no long being produced so they will climb no further. However, companies like Icon made their first tiny impact on the list with a single registration in 2015. I visited with Kirk Hawkins at Aero; he invited me to see their production facility in a month or so. When that California airframer begins serial production, their large number of orders should thrust them upward at an increasing pace (troublesome contract problems notwithstanding). In recent years our main chart also attempts to at least mention ELSA ad EAB where we believe we can rely on the numbers we find. Our more recent chart of single year performance is lead again by CubCrafters although even their pace slowed for 2015. The Western U.S. producer remains well ahead but others have done credibly well: Czech Sport Aircraft, Pipistrel, Progressive Aerodyne (Searey) and Van's. SportCruiser registrations were up from 2014 as were Pipistrel's while Van's, American Legend, Aerotrek, and Flight Design were down. Tecnam's numbers reflect only registrations of their LSA models but the company reports selling a similar number of type certified aircraft so their total American market presence is greater than our charts reflect. One you haven't seen at airshows in the last couple years is the Phoenix Air motorglider, an elegant machine but one in too-short supply, said U.S. importer Jim Lee. He has not been attending shows and will drop his advertising as delivery delays have stretched out too far despite interest he has found from American soaring enthusiasts. As noted, Icon added only one SLSA registration in 2015, Cessna is gone, and Quicksilver experienced their own drop from 2014 as that company reorganized. However, honorable mentions are deserved for Super Petrel (4 added), Sling (3), Brazilian Paradise is returning to the market after an absence (2 in 2015) and Topaz continues to build modestly (2). Another interesting development just announced includes the return of Zenair and their popular CH-750 STOL aircraft that will again be assembled as a ready-to-fly SLSA by M-Squared Aircraft in Alabama. Those readers fascinated with these numbers may wish to compare 2014 and 2013 info, so click those links to read those earlier reports. We dropped Allegro from the top-20 ranking even though their aircraft still has a good count as we've done with a few other brands over the years. Finally, while our main chart focuses on the top brands, note that the largest single percentage are registrations from "All other producers." So-called boutique brands still have their place in the LSA spectrum. As always, our disclaimer is that we only count FAA registrations and only those from the USA, which leaves out the rest of the world that accounts for most sales of LSA-type aircraft. Our statistics will not be identical to what companies reports as sales and do not include aircraft retired from service for any reason. Lastly, I repeat we cannot accurately count a share of new aircraft sales that might amount to 20-25% more if the data were reliable. These observations combine to make a more conservative report than may actually be factual but we prefer to err on the side of caution. Article Updated 8/8/16 — The second chart appearing below for Calendar 2015 results had errors in the spreadsheet formula. They have been corrected below. —DJ My associate in Europe, Jan Fridrich of LAMA Europe, has been the source for a database search for many years as I seek to report market share statistics in the USA. He scours the FAA registration information and laboriously assembles the numbers. As he and I work to produce accurate info, Jan often makes contact with selected companies when questions arise, as they often do. I also reach out to producers in our effort to make the best possible use of the registration data to create our rankings. Jan has been one of his country’s representatives in the Czech Republic’s official work with the Chinese to help that nation build its lighter aviation infrastructure. He’s made many trips to China in the last two years. Pipistrel's long-winged Sinus did quite well during the first half of 2015. Florida-based Progressive Aerodyne is surging in sales since winning SLSA acceptance. They have also cracked the Chinese market. The U.S. market for Special Light-Sport Aircraft continues to grow at steady pace, modestly better than the trend for single engine piston certified aircraft as reported by the General Aviation Manufacturers Association for the first half of 2015. SLSA deliveries in the half-year period totaled 97 units, with 91 of those coming from 15 manufacturers, showing that the famous 80/20 rule still generally applies ... more than 80% of the market is supplied by less than 20% of the builders. It also implies the majority of those companies who previously earned FAA acceptance for their LSA models are either quite slow or inactive in the U.S. market. We'd prefer to describe vigorous growth but the so-named Great Recession seems to be lingering on; at least it appears the much-talked-about recovery has left most of aviation still looking for improved business. Evidence of a still-troubled global economy is even clearer when you consider the wild stock market gyrations of recent weeks. Even while some sectors and companies continue to struggle, some are more successful. In this first half 2015 LSA market share report, we'll hit some highlights and save a more detailed analysis for the full 2015 year report early next year. One LSA businessman asked, "I know some companies out there may be claiming [many sales]." Yet other than Icon — and previously Cessna — I have never heard of any company that claimed to have sold large numbers of airplanes. Most of the more successful producers have moved steadily forward without any big leap in sales. The laborious research done so faithfully by my friend and LAMA Europe business associate, Jan Fridrich, allows me to report first half 2015 numbers. Jan's study of FAA's N-Number registration database shows four companies with decent results. Of course, "decent" is a relative term. If you compare airplane sales — at any level from hang gliders to bizjets — to automobile sales or smartphone deliveries, the numbers look microscopic. Remember, the entire world has somewhere over one million pilots and only one in four of them might own an airplane bought any time in the last quarter to half century. Building airplanes is not a volume business and aircraft production is probably closer to that of exotic supercar manufacturers. One hundred sales in a year is a great performance and very, very few companies hit or exceed that. Special LSA registrations are running almost identical to 2014's figures. This can be viewed positively in the sense that it is better than GAMA's reported 12% decline for the first half of 2015. Regretfully, both sets of numbers show continued softness in aviation, whether general or sport/recreational. Figures for the LSA industry appear to be about a quarter of GAMA's Single Engine Piston category that compares most accurately with SLSA registrations. However, as I've often observed, the U.S. market is by far the largest for general aviation airplanes where sport and recreational sell better outside the USA. When you consider the rest of the world, LSA or LSA-type aircraft may sell two to three times the number of certified aircraft sold in America. Unfortunately, widely differing national systems make it very difficult to count aircraft in other countries. We prefer to report solid information rather than guesstimates even if it makes the industry look smaller than it is. For a look at global figures see this article and this one, which was updated here. 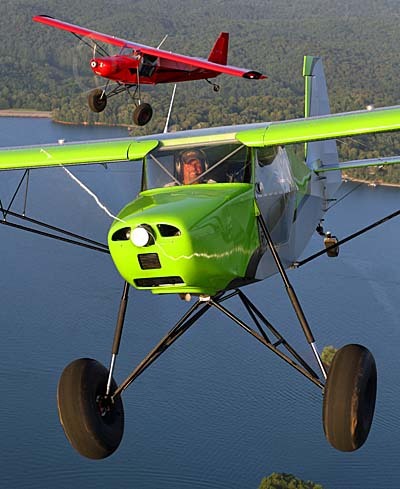 Our numbers also reflect only fully manufactured LSA as those are the only aircraft we can reliably count when researching FAA's registration database, regretfully omitting weight shift, powered parachutes, motorgliders, and of course, gyroplanes. Nonetheless, we do have some valid information for ELSA (at least for the most recognizable companies, such as Van's Aircraft). Adding known ELSA and those Experimental Amateur Built models boosts the total. In the first half of 2015, CubCrafters remains the strongest seller logging 23 new registrations or about one a week. The western U.S. producer is steadily approaching Flight Design's once-unassailable #1 spot although Icon is a company that could dramatically alter the market share ranking if they are successful at serial production of their large order book. Pipistrel registered 17 SLSA in the first half of 2015, which looks to be the second best performance after CubCrafters. 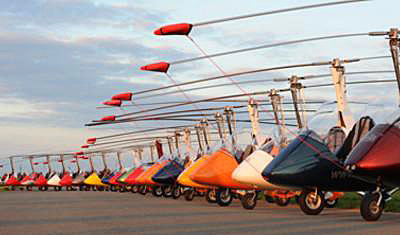 The European company also sells a fair number of motorglider types registered differently from SLSA. Indeed 14 of the 17 were their long winged Sinus that offers interchangeable wing extensions (see video). Progressive Aerodyne has also accelerated smartly since winning FAA acceptance of their SLSA version of their popular Searey that has been quite successful as a kit-built model. 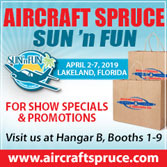 The Florida seaplane producer has also cracked the China market and may soon become the number one LSA seller in that country. They've already sold a dozen Seareys and have several more orders in the pipeline. If China grows as many anticipate, this American company could move forward quickly, especially in a region where airports remain in short supply. Other companies that did reasonably well in the first half of 2015 include Jabiru (who also reported good sales at Oshkosh that should show up in our report covering the second half of 2105), Tecnam, SportCruiser, Flight Design, Aerotrek, American Legend (with their powerful Super Legend), Rans (S-7LS), and the lovely Phoenix LSA motorglider. Postscript — I don't know how many of you saw AOPA writer Al Marsh's article, but the following appears to show a fairly rosy future for Light-Sport and Sport Pilot. Of course, as Al notes, FAA cannot see the future better than anyone else. Nonetheless, here's what he wrote: "Where is general aviation headed? 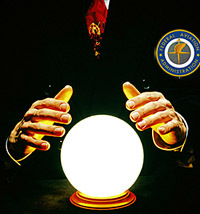 The truth is, nobody knows, but the FAA is paid to try to predict the future. Earlier this year the FAA released these numbers that are as good as any at predicting the future." 593,499 Total number of pilots in 2014 — predicted to increase to 617,000 in 2035 174,883 Number of private pilots in 2014 — predicted to drop to 163,600 in 2035 120,546 Number of student pilots in 2014 — predicted to drop to 112,200 in 2035 44.8 Average age of a U.S. pilot in 2014 (Note: LSA pilots tend to be markedly older) 139,890 Number of aircraft in the piston-engine fleet in 2014 — predicted to drop to 125,935 in 2035 198,860 GA fleet total in 2014 — predicted to increase to 214,260 in 2035 2,200 Estimated Light-Sport Aircraft fleet in 2014 • — predicted to increase to 5,360 in 2035 5,157 Number of Sport Pilots in 2014 — predicted to grow to 14,950 by 2035 • I do not know where FAA found this number since their own database shows more than 2,750 SLSA through December 2014 based on a study of the agency's registration data. The U.S. market for Special Light-Sport Aircraft continues to grow at steady pace, modestly better than the trend for single engine piston certified aircraft as reported by the General Aviation Manufacturers Association for the first half of 2015. SLSA deliveries in the half-year period totaled 97 units, with 91 of those coming from 15 manufacturers, showing that the famous 80/20 rule still generally applies … more than 80% of the market is supplied by less than 20% of the builders. 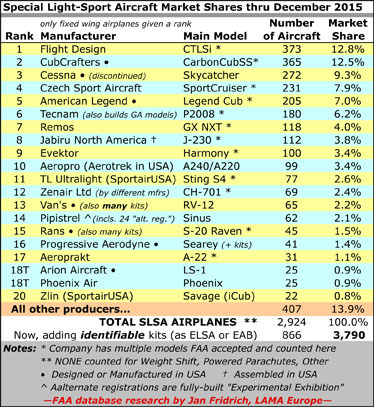 It also implies the majority of those companies who previously earned FAA acceptance for their LSA models are either quite slow or inactive in the U.S. market. We’d prefer to describe vigorous growth but the so-named Great Recession seems to be lingering on; at least it appears the much-talked-about recovery has left most of aviation still looking for improved business. Evidence of a still-troubled global economy is even clearer when you consider the wild stock market gyrations of recent weeks. Update Notice — The following article has been updated to reflect additional information. Please read at this link. Thanks to a solid effort by GAMA, the General Aviation Manufacturers Association, I have data that can be used to assess the numbers of recreational aircraft around the world. That organization is significantly focused on business aircraft but did include all levels of aircraft in their country-by-country review. Whatever the actual level of accuracy — GAMA is wholly dependent on the data the organization received from various CAAs in each country — GAMA’s data is some very useful info and I am in their debt for the information discussed in this review. In addition to GAMA having to use whatever each country reported, the methods of reporting were not consistent. For one noteworthy example, several countries listed as their smallest aircraft those weighing 5,700 kilograms (12,540 pounds), which represents far larger aircraft than your typical four-seat GA aircraft and certainly any recreational aircraft. As the new year dawned my good friends at General Aviation News published my article on the light aircraft industry using Rotax deliveries (and estimates of other engine brands) to estimate worldwide sales of recreational or sport aircraft. The article was presented online as 2015 began and has since appeared in a print edition. This article was updated 1/12/15 and 1/23/15. On the "The Pulse of Aviation" (sign up here; it's free) you can read my article that generated a large number of reader comments, some of which were quite colorful. •A technical glitch that took down the comments has been fixed and you can again peruse the many comments.• GA News is published 26 times a year (subscribe here) and the article was just released in the print version. Online, a few responders apparently didn't think much of LSA with some relying on outdated information. Several others were very supportive. That's the value of free speech and comment sections that permit such open exchanges in the Internet Age. Here I present a somewhat different message. The first article was aimed at an audience including general aviation pilots, many of whom do not know the LSA or light kit community well. This one is aimed at those following light aviation more closely. As detailed in the GA News article, I reported a market for very light aircraft and Light-Sport-type aircraft that substantially exceeds 3,000 units per year worldwide. Many American pilots remain unaware that the rest of the world flies a large number of light aircraft in the recreational or sporting categories. Overseas, these are commonly referred to as Ultralights or Microlights, Very Light Aircraft, or Light-Sport Aircraft. As you probably know Euro Ultralights are quite different from the U.S. version. Most pilots in the USA focus on what are sometimes called "traditional" general aviation aircraft for which GAMA has reported delivery numbers for many years. Regular tallies of FAA's N-number registration database show that in the USA the ratio is approximately 80/20, traditional GA airplanes to recreational aircraft. In Europe and most other countries that ratio is reversed with GA representing approximately 20% of all civilian aircraft with 80% recreational, according to people who try to assess such figures. This large percentage includes gliders (very big in Europe) but even omitting sailplanes the ratio is quite lopsided in favor of powered recreational aircraft. For most international pilots, GA aircraft are too expensive to buy and operate outside the USA. "From 1989 through June 5th, 2014, we have sold 50,000 four-stroke engines of the 912 and 914 model designation," noted Christian Mundigler, Key Account Manager of Rotax Aircraft Engine Sales. "On the two-stroke engine side we sold all together more than 120,000 units up to now," he said. 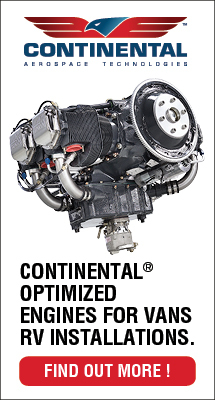 These deliveries show Rotax is surely the most prolific producer of engines, but Continental, Jabiru, and Lycoming add powerplants used on recreational aircraft. Assuming their output is about 600 units per year — likely a conservative estimate and only considering production for the light aircraft sector — we calculate the UL/LSA/VLA sector probably reaches beyond 3,500 airframes per year. In comparison, GAMA will likely report less than 1,100 piston-powered aircraft of all types and sizes from all association members around the globe for 2014 based on information released for the first nine months of the year. Thus, when you include shipments to all countries, the light recreational aircraft market represents a large portion of all civilian, non-commercial airplanes being delivered. With the American LSA and light kit market taking less than 1,000 of the Rotax's annual 3,000-plus aircraft engine production, where are all the others going? "Averaging over a long term our main engine market, including two- and four-stroke powerplants, Europe has around half of the share," reported Mundigler. "The Americas, including North, Central, and South, has about a third of the total." "Growing markets are Russia and China with double digit increase rates in recent years," said Mundigler. Rotax engines run fine on auto gasoline or 100LL aviation fuel; operators can mix mogas and avgas in any proportion without concern. 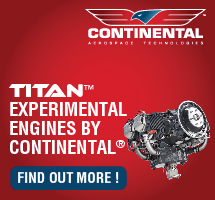 Jabiru also works fine with mogas and Continental has engine models that do as well. Around the world, aviation fuel is not widely available and, as American pilots know, avgas carries a substantial price premium though much less than the $10-12 per gallon in Europe. From the figures used in this article, we can see the light, recreational aircraft industry is alive and well and makes up the largest unit volume share of all aircraft delivered each year. As the new year dawned my good friends at General Aviation News published my article on the light aircraft industry using Rotax deliveries (and estimates of other engine brands) to estimate worldwide sales of recreational or sport aircraft. The article was presented online as 2015 began and has since appeared in a print edition. This article was updated 1/12/15 and 1/23/15. On the “The Pulse of Aviation” (sign up here; it’s free) you can read my article that generated a large number of reader comments, some of which were quite colorful. •A technical glitch that took down the comments has been fixed and you can again peruse the many comments.• GA News is published 26 times a year (subscribe here) and the article was just released in the print version. Online, a few responders apparently didn’t think much of LSA with some relying on outdated information. In July I posted an article about an AOPA survey conducted through the biggest member organization's daily newsletter, eBrief (sign-up page). That provided a broad glimpse into both the mind of an AOPA eBrief reader (and responder) but might also be used to forecast some possibilities for the LSA industry. In this article, I'm going to again use the survey data but look at such information in a different manner. I suspect LSA business people will read this with interest but it may be meaningful to any pilot interested in buying or partnering their way into a LSA or in finding a Light-Sport Aircraft available for students and others to fly at flight schools and FBOs around the country. LSA are by no means limited to the USA, of course, so I'll also make some informed guesses about what I see as the global aspect to the LSA development, now beginning its second decade*. Let's do a bit of number review to help put this in context. AOPA reports about 400,000 members, making it by far the largest pilot membership organization in the world. Let's be conservative and say only about 300,000 are active or interested in being active. (I hope the number is not this small, but I prefer to err on the side of caution in this review.) 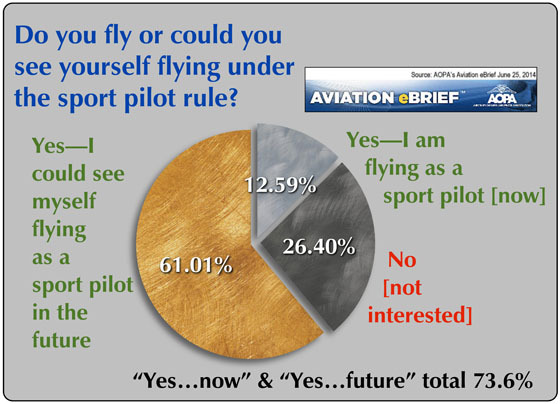 As the nearby chart shows, 12.59% of eBrief readers say they are now flying while using the privileges of the Sport Pilot certificate. While 26.4% said they were not interested in sport pilot, the largest single group responding said they could envision themselves flying as a sport pilot in the future. The two affirmative answers total 73.6 percent. I stress that these numbers come from eBrief readers and may not mirror all AOPA member opinions. However, assuming the sample size was large enough to be valid — for reference, surveys of about 1,000 are commonly used to sample the entire U.S. population — then this eBrief survey might mean the following. Assuming 300,000 "active" AOPA members, 12.59% of them represents 37,770 members. The future figure 61.01% would represent 183,030, and the two numbers sum to 220,800 members. Based on FAA registration data, we know 37,700 do not presently own a LSA nor a compatible kit aircraft nor a parameter-meeting Standard Category airplane but aircraft ownership was not the question posed. However, whether they own them or someone else does, that many pilots could be flying LSA or LSA-like aircraft that do not require a medical. Apparently many more are intrigued by flying modern, fuel-efficient, and superbly equipped LSA or other aircraft that don't require a medical. Note that beside fully built Special LSA, Sport Pilot certificate holders may fly Standard Category aircraft or homebuilt aircraft so long as those flying machines meet the parameters (1,320 pound gross weight; speed less than 120 knots, etc.). Thus, available aircraft include SLSA, ELSA, Experimental kit-built aircraft, or other Sport Pilot-eligible aircraft beyond LSA. If at some time 220,800 AOPA members are interested in flying as a sport pilot, how many might one day consider buying a new or used Light-Sport Aircraft? This question is far fuzzier so let's soberly reduce the numbers. We can guess that only one in ten of those (or 22,080) are truly interested to buy a LSA. Of that group, we can estimate only one in six of potential buyers (3,680 or 1.67% of interested members) will act on that interest. If it took ten years to fulfill such market potential, that averages 368 aircraft per year. Based on the first decade of LSA, this figure is certainly achieveable; the industry can safely produce this number ... indeed, has produced many more in the years before the Great Recession. Are these assumptions reasonable? Who knows? The GA industry sells more single-engine piston aircraft per year so those numbers certainly aren't beyond belief when considering the potential large interest from AOPA members as reflected by responses to the eBrief survey. For LSA producers, the estimates above are only part of the story. In the sport or recreational aircraft world, the USA is not the dominant market. It is surely the largest single-nation market but the rest of the world easily accounts for at least 1:1, that is, for every sport aircraft sold in America, at least one may be sold in some other country (though we lack hard evidence of this). As LSA are presently accepted in several other nations with more to follow, the 1:1 ratio remains conservative, I feel. Thus, 368 U.S.-delivered aircraft could translate to 736 aircraft sold globally each year for the second decade of Sport Pilot / Light-Sport Aircraft. Will this occur? The only sure way to know is to ask again in 2024 but my speculation using the AOPA eBrief survey numbers is that the future for LSA remains bright. * The SP/LSA rule was announced July 20, 2004 but the first aircraft were not FAA accepted then delivered to customers until April of 2005. So, LSA will only reach their first full decade completed by Sun 'n Fun 2015. In July I posted an article about an AOPA survey conducted through the biggest member organization’s daily newsletter, eBrief (sign-up page). That provided a broad glimpse into both the mind of an AOPA eBrief reader (and responder) but might also be used to forecast some possibilities for the LSA industry. In this article, I’m going to again use the survey data but look at such information in a different manner. I suspect LSA business people will read this with interest but it may be meaningful to any pilot interested in buying or partnering their way into a LSA or in finding a Light-Sport Aircraft available for students and others to fly at flight schools and FBOs around the country. LSA are by no means limited to the USA, of course, so I’ll also make some informed guesses about what I see as the global aspect to the LSA development, now beginning its second decade*. As always, we remind you that all numbers here are derived from FAA's N-number registration database and are subject to data entry errors. Figures presented are not identical to sales recorded by the companies though over time the numbers draw closer. This chart, created by Jan Fridrich for a presentation at Aero in Germany, shows trend lines for several categories. While LSA continue to slump, some see this as the "bottom" and reported order taking over the last 18 months supports future improvement. Of interest is the brown line for German and Czech ultralights or microlights (similar though slightly lighter than U.S. LSA). Note its volume similarity to LSA and the steadiness of the line throughout the economic downturn from 2008 to 2012. Germany and the Czech Republic are two of the most active countries in Europe. UPDATE: May 27, 2014 — "A vigorous debate ensued ..." might be one way to refer to a four-way discussion from around the globe. Over the last few days, LSA industry folks in distant lands worked on market share details. Michael Coates is the Australian-based U.S. distributor for Pipistrel, an aircraft fabricated in Slovenia and assembled as a LSA in nearby Italy for shipment to the USA. My Czech-based associate, Jan Fridrich, was in China again because his country works with that nation as they build a personal aviation sector virtually from scratch. From our corners of the world we tried to resolve a problem that regularly occurs in our study of the FAA registration database. Pipistrel maintained their SLSA airplane numbers were stronger. Jan and I communicated and finally agreed that we were underreporting their numbers. The chart below has been modified to reflect a truer situation, sharply moving Pipistrel upward from 20th to 14th rank. Essentially, the problem stems from some Pipistrel aircraft being registered as "gliders," which is one of those categories Jan and I do not feel we can consistently count with accuracy. After Jan studied the database we chose to update the chart with the understanding that our next reporting may see another minor adjustment. As with many statistical evaluations, these reviews often get better as the survey gets larger over a longer period of time. Meanwhile, congratulations to Pipistel for improving their standing ... and for informing us. If other sellers believe their registrations are reported in error, we'd like to hear about it so we can do our best to deliver quality, accurate information. —DJ We are past due for a market share update and several of you have written to ask. As most readers know, I create my report from information assembled by my LAMA associate and friend Jan Fridrich who puts hours into the tedious duty of sifting through FAA's database. It isn't only time consuming, exacting work. He must also make many determinations as FAA's database is not always clear as to model types or other descriptions. As many of you are aware, we do not report weight shift, powered parachutes, gyros, or motorgliders as those are aircraft types we cannot accurately count. I wish we could report those "alternative aircraft" — doing so would make the totals more reflective of the true LSA market — but we cannot. Jan has also been unusually busy going to many meetings ... the kind you would not care to attend: long, dry meetings in various countries where regulators and industry leaders go over rules in excruciating detail. Someone has to do it and I'm thankful for people like Jan who endure these sessions. For this reason, I was unwilling to push harder for his study of the database. However, he has done it again so a hearty THANK YOU, JAN FRIDRICH for your dedication to this industry. As I've written and as many are aware 2013 was not a strong year for SLSA registrations. It was an improved year for sales but after so many down-economy years manufacturers had reduced their manufacturing capacity — achieved by releasing employees, employing less manufacturing floor space, maintaining smaller raw material inventories, keeping fewer engines on hand and so forth. So, when sales mounted a comeback in 2013, builders were unable to keep up. Backlogs stretch out to a year for some companies. That may improve in 2014 as they cautiously increase their rates of production but meanwhile several companies tell customers it can be several to many months before a new order will be available to them. So far first quarter numbers for 2014 continue to reflect these delays but I have received several comments that new LSA are beginning to arrive more regularly. Cessna, as one notable example, slipped from second to third and will continue moving lower now that they halted production. Their exit alone caused a drop in the totals. Yet others, like Icon Aircraft, will eventually hit the chart and move up as they begin to deliver from their list of 1,000+ customers holding order positions. One industry expert told me, "My input [is] that 2013 will be the bottom of the LSA market, which means there is nowhere to go but up. If you counted all ELSA 2013 was really pretty decent, with RV-12 leading the pack. CubCrafters' order book is very healthy, too." To that I add the following thought ... Entire LSA Market — I want to refer you to a different market report I issued earlier and note that besides weight shift, powered parachutes, gyros, or motorgliders, we also do not report ELSA (kit LSA). Again, the data entry process is difficult for FAA clerks because so many makes and models are present to confuse those less involved with the sector. Experimental Amateur Built aircraft can be flown by Sport Pilots and are sometimes incorrectly called Light-Sport. ELSA may receive their airworthiness certificate only if they are identical to the SLSA version accepted by FAA, however, afterward they can change. 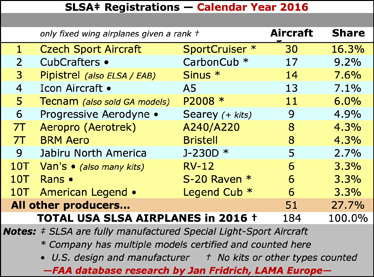 With 136 SLSA models, it doesn't surprise me that errors creep into the database but for our charts to make sense year-over-year, we report only the most identifiable group: Special LSA airplanes. Yet this means that to know the whole market size you must add a substantial, growing percentage (as much as 50% more) to include those other aircraft. Chart Explanations & Disclaimer — If you compare numbers from one year to the next, you may see changes you cannot explain. For example, a company's numbers can go down if, for example, aircraft are taken out of service due to theft, damage, or sale outside the USA, which means they may be removed from FAA's database. Some companies in the USA also distribute to Canada or Mexico and LSA going to those countries will not be counted in our chart even while they rightly call them a sale. Comparing "Total" Figures — Rob Rollison of Aerotrek, besides doing a steady job of selling his reasonably priced A220s and A240s, often comments that our chart numbers do not perfectly reflect all SLSA that his company has registered. If a LSA is destroyed, by a hangar collapsing on it let's say, that aircraft will eventually come off the FAA database making it appear that it was never sold. Thus, FAA's current registry does not fully state the total registrations that ever occurred. "If Model A Ford cars were in some current U.S. registry, we'd see 50 of these antiques today, not the millions Ford once sold," noted Rob. He is correct; our chart (and FAA's database) does not include every SLSA ever registered. Counting all of them would make the total somewhat larger. However, we stick to our same methods in the interest of keeping our chart consistent through the years even though it undervalues the industry's true sales. As further explanation, you can see the chart shows 76 Aerotreks models in the FAA database. Rob has provided an exact accounting of every U.S. registration he ever made and his figure is at least 83, though he notes four were damaged and some others transitioned to ELSA status, which suggests our reported figures are very close. Until we can collect actual — and honest, valid — sales data from all manufacturers, our chart is the one we present. The market is truly larger than either chart suggests. We appreciate if all readers keep this in mind when studying the LSA Market Share Chart. UPDATE: May 27, 2014 — “A vigorous debate ensued …” might be one way to refer to a four-way discussion from around the globe. Over the last few days, LSA industry folks in distant lands worked on market share details. Michael Coates is the Australian-based U.S. distributor for Pipistrel, an aircraft fabricated in Slovenia and assembled as a LSA in nearby Italy for shipment to the USA. My Czech-based associate, Jan Fridrich, was in China again because his country works with that nation as they build a personal aviation sector virtually from scratch. From our corners of the world we tried to resolve a problem that regularly occurs in our study of the FAA registration database. Pipistrel maintained their SLSA airplane numbers were stronger. Jan and I communicated and finally agreed that we were underreporting their numbers. The chart below has been modified to reflect a truer situation, sharply moving Pipistrel upward from 20th to 14th rank. In talks I give at airshows, I've begun to focus on what I term the "real" LSA market. Many folks are confused and even our ByDanJohnson.com statistics and articles about market share ranking add to the fog obscuring the big picture. The chart below attempts to burn off that fog and provide a clearer understanding. However, the table — meant for use when I proceeded line by line in a live presentation — needs some explanations. The chart attempts two tricks. The first goal was to contrast general aviation (GA) with Light-Sport aviation. We compare only to single engine piston GA aircraft as we saw that as the closest match. So the chart has at top left, a figure of 790, which is the number of Type Certified general aviation aircraft delivered in 2012, the latest full year of information at the time of the chart's creation. Come down one line to see the total of Special LSA airplanes registered in 2012, again noting that LSA report registrations where the GA industry states deliveries; these two stats are not identical but are close enough for the purposes of this discussion. As you can see, the industry registered 259 aircraft. The term "Ratio" relates 259 to 790, showing LSA registrations to be about a third of GA single engine piston aircraft delivery. 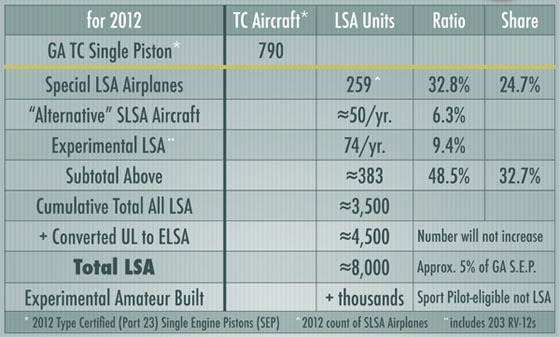 The term "Share" means the LSA portion of the sum of 790 + 259 or 1,049 total single engine piston aircraft. Secondly, however, SLSA "airplanes" are not all the "aircraft" in the LSA fleet. "Airplanes" refer to fixed wing, three axis ... basically more conventional aircraft. "Alternative LSA" refers to weight shift, powered parachute, gyroplane, and glider categories that add more registrations. We do not include the latter group in our market share rankings as the FAA database on these aircraft are suspect. The reason is the many different models and names and a general lack of database entry clerk awareness of them coupled with registration applications that likely confuse those clerks with different naming conventions. For example, a trike with a different wing is a somewhat different model but could use the same or a different name. Powered parachutes can be equally baffling to the uninitiated. Even though we can't count them reliably (so we skip them, with regrets to those enthusiasts), they are real and they are being sold. They add an average of another 50 or more SLSA per year, which represents a bit over 6% of all GA aircraft sold. Then, we have to add ELSA or Experimental (not factory built) LSA. More are coming but Van's Aircraft's RV-12 presently dominates this field, having registered 203 units by the end of 2012. All told, ELSA add an average of 74 units per year, which is nearly 10% of all general aviation single engine pistons delivered. Sum these groups and you have an estimated 383 registrations of LSA types in 2012, a figure that is nearly half of the GA single engine pistons and a third of all aircraft manufactured in 2012. Yet, as the late night infomercials boast, "That's still not all!" Adding to the total of LSA aircraft are many former two seat ultralights that were registered as a kind of special ELSA during a grace period. That period ended some years ago, so no more will be added, but we estimate that at least 4,500 examples are still flying. Add them all and you see more than 8,000 Light-Sport Aircraft, which accounts for about 5% of the entire single engine piston fleet in the USA ... but that still doesn't fully describe the sector. We finish the picture by noting that many Experimental Amateur Built (the so-called 51% rule airplanes) can be flown by someone possessing a Sport Pilot certificate or using a higher certificate without a medical to operate as a Sport Pilot. We don't provide an estimate, but cautiously call this "thousands" more. Many people call these "Light-Sport Aircraft" but they are not; they are EABs. Likewise some folks still call the Sport Pilot certificate a "Light-Sport license," which is an incorrect term. We prefer to call these "Sport Pilot-eligible" aircraft using a phrase coined by EAA staffer Ron Wagner. We hope the chart above helps to clarify the true size of the LSA market. Remember, these figures only refer to the United States. Many thousands more fly in other countries. Next, let's look to the future. The graphical chart comes from Barr Group Aerospace. Chart lovers can find many more at this website focused on general aviation (most of the info is for larger, working aircraft). The following chart shows the history — including the plunge from 2007 figures to the depths of 2010, a slide of greater than 50%. It also gazes into a crystal ball and attempts to show future trends. Right or wrong, the view of the statisticians behind this chart suggests a strong role for Light-Sport Aircraft at about 23% of all aircraft including jets and Experimentals. Jets are expected to grow as are Experimentals. It looks less rosy for piston and turboprop perhaps as LSA and EABs will capture some of these sales. Then, we have to contemplate the arrival of a new wave of four seat or larger aircraft from the flock of non-legacy companies currently building two seat LSA ... but that's a story for another article. In talks I give at airshows, I’ve begun to focus on what I term the “real” LSA market. Many folks are confused and even our ByDanJohnson.com statistics and articles about market share ranking add to the fog obscuring the big picture. The chart below attempts to burn off that fog and provide a clearer understanding. However, the table — meant for use when I proceeded line by line in a live presentation — needs some explanations. The chart attempts two tricks. The first goal was to contrast general aviation (GA) with Light-Sport aviation. We compare only to single engine piston GA aircraft as we saw that as the closest match. So the chart has at top left, a figure of 790, which is the number of Type Certified general aviation aircraft delivered in 2012, the latest full year of information at the time of the chart’s creation. Come down one line to see the total of Special LSA airplanes registered in 2012, again noting that LSA report registrations where the GA industry states deliveries; these two stats are not identical but are close enough for the purposes of this discussion. At least aviation is not bowling! Recent articles say the number of American bowlers has plummeted from nine million to two million, a drop of 78%. Compared to that the aviation industry looks far more durable (line chart). Indeed, aviation in all sectors is facing challenges but we are buoyed by reports in the same newspapers that say Americans are feeling more financially secure since stock markets are up substantially and houses are selling faster and at better prices. However, as we'll show below, 2013 is one of those transition years. That means that sales have been occurring at an increased pace, but due to companies assuming a defensive posture in the 2007-2011 downturn, production is now lagging behind sales just as it was in 2005-2006 when LSA burst on the scene. I'm optimistic that 2014 is going to be a much stronger year. I am not the only one. 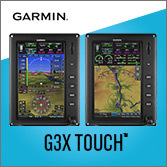 "I feel we will be experiencing two significant growth years in 2014 and 2015 based on the continued aging of the pilot population and the pent-up demand in the marketplace," said Tim Casey, Garmin's sales manager for portables, LSA, and experimental aircraft markets. In his role for the big avionics maker, Tim keeps a very close eye on the industry. "Combine that with the activity surrounding the Part 23 re-write and it appears we may be approaching an inflection point in the market," added Casey. The biggest single change in the LSA market numbers is that Cessna appears to have thrown in the towel on Skycatcher (article). Whatever the corporate decision may ultimately be, the fact is that Cessna registered zero Skycatchers in the first nine months of 2013. In all of 2012 ... 94. Remove the "Cessna variable" and you might say LSA registrations are up in 2013 (though that analysis might have too much "sunshine" for some readers). To be honest, the numbers still look weak though fortunately some bright spots exist. Two brands — CubCrafters and Van's — are game changers. As noted Van's has elected to take its popular RV-12 more deeply into fully built SLSA. In the same part of the country, CubCrafters is again showing great strength. Plus, several of our top suppliers remain very active even if their registration numbers look light. One company said they'd made more than 30 sales yet registered only a quarter of them, all in 2013. As the engines of production accelerate around the USA and world, we can see rising currents of air in the industry. Unlike in years past, the U.S.-based manufacturers in particular seem ready to lift more pilots aloft. Hoping for a much improved 2014 and 2015 and focusing on the companies that did enjoy a good first nine months of 2013, we tick off the top performers. Once again, the LSA pack is lead — very convincingly — by CubCrafters with a solid 40 new registrations in nine months. Calculating forward, the Yakima company should hit 53 aircraft registered, boosting last year's good performance by another 10%. At this rate, CubCrafters will pass Cessna and give Flight Design its greatest challenge so far. Congratulation to Jim Richmond's CubCrew! In the first nine months of 2013, CubCrafters is trailed at some distance by SportCruiser logging 13 registrations and American Legend with 12. Both performances are good; U.S. Sport Aircraft has maintained admirable sales consistency even through the down years and Legend bounced back from some soft years of late. Another top brand that is reviving nicely is Tecnam with 10 registrations in the first nine months of 2013. Please remember, all numbers are derived from the FAA registration database and are rarely in perfect sync with a company's sales activity; over time, these differences find equilibrium. A notch back but still finding good performance in a sluggish economy is Pipistrel, which logged eight registrations and finally arrived in the Top 20 List. Flight Design added seven registrations but is one of those companies reporting much better sales albeit with delivery lags slowing their entry to the FAA database. Tied with Flight Design is Aerotrek. For this company, the figures represent another good performance; they ranked third in 2012 registrations, now move into the Top 10, and have generally been a model of consistent sales. Producer Aeropro takes a conservative approach and can only allocate a limited number of their production to the USA (England is presently hot for them). Phoenix Air USA, importer of the gorgeous motorglider of the same name registered three and has also had to learn patience with the manufacturer's cautious delivery pace. In 2013, the refrain has been that sales are up from 2011 and 2012 but deliveries are not keeping up, a situation that should improve as builders sense better economic conditions. Finally, remember that many producers sell elsewhere in the world. ByDanJohnson.com is now read 31% by pilots not residing in the USA and this helps to show the global effect LSA is enjoying. So, as 2013 closes, we wish all readers a HAPPY NEW YEAR ... we think it is going to be a good one! Notice: As always, we observe for you that all numbers here are derived from FAA's N-number registration database and are subject to data entry errors. Figures presented are not identical to sales recorded by the companies though over time the numbers draw closer. At least aviation is not bowling! Recent articles say the number of American bowlers has plummeted from nine million to two million, a drop of 78%. Compared to that the aviation industry looks far more durable (line chart). Indeed, aviation in all sectors is facing challenges but we are buoyed by reports in the same newspapers that say Americans are feeling more financially secure since stock markets are up substantially and houses are selling faster and at better prices. However, as we’ll show below, 2013 is one of those transition years. That means that sales have been occurring at an increased pace, but due to companies assuming a defensive posture in the 2007-2011 downturn, production is now lagging behind sales just as it was in 2005-2006 when LSA burst on the scene. I’m optimistic that 2014 is going to be a much stronger year. I am not the only one. “I feel we will be experiencing two significant growth years in 2014 and 2015 based on the continued aging of the pilot population and the pent-up demand in the marketplace,” said Tim Casey, Garmin‘s sales manager for portables, LSA, and experimental aircraft markets. CubCrafters has steadily moved upward in fleet size and has enjoyed two strong years in 2012 and 2013. The future remains bright for Light-Sport Aircraft with interesting designs in the pipeline, improved models from well-known builders, and a wide price range able to suit most budgets. Importantly, the safety record remains good. Pictured is Terrafugia's proposed TF-X. A number of you have asked about an updated sales report for 2013. While remembering that we report registrations not sales, this year has been a different sort. Registrations are down from 2012, with the exception that CubCrafters remains the registration (and presumably sales) leader. American Legend and their Cubs are also showing more activity than previous years. Beyond the yellow taildragger squadron, it's something of a mixed bag. More on that below. •• Let me offer you another statistic that amazes me while speaking to ever-growing interest in Light-Sport Aircraft and light kit aircraft that Sport Pilots may fly. In September, ByDanJohnson.com set an all-time record with 71,400 Unique Visitors, 25% higher than our previous record (July 2013). In 2013, Unique Visitors have averaged more than 35,000 per month, a figure more than double 2012, which had been our best year ever. If I appear to be bragging too loudly, let me say that I believe this website is merely the messenger and that it is a fleet of great LSA and a solid team of suppliers and service providers that is delivering visitor growth. 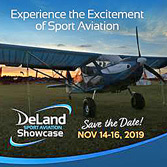 People are flocking to ByDanJohnson.com because, I believe, LSA and Sport Pilot-eligible kits and other aircraft are THE growth area for aviation. Thanks to less obtrusive regulations and greater design freedom, this sector is where innovation shines at (relatively) affordable cost. We thank you for stopping for a visit and we welcome you back often. If our website traffic is soaring and if LSA and SP-eligible kits and airplanes are the growth area, why are registrations off significantly in 2013? It's a valid question and I don't presume to have all the answers. However, I'd like to describe the history to help explain. At the dawn of SP/LSA, anticipation had grown to a fever pitch over this new class of airplane with its own pilot certificate. The lack of need for an aviation medical was a huge component, but it was more. General aviation manufacturers, hobbled by a frightfully expensive regulatory structure, were only rarely coming out with new airplanes and the cost of these aircraft was breathtaking (and still is ... a Cirrus SR22 can sell for more than $800,000!). FAA is finally acting to move toward industry consensus standards for GA aircraft and we think that will be helpful. Meanwhile the combined effort by AOPA and EAA to rid pilots of the need for a third class medical to fly certain larger airplanes appears completely stalled, even by the organizations' own statements, leaving LSA as the only alternative for a growing community of older aviators. "You're only one medical away from an LSA," went the line. In the heady days of 2005-2006-2007, LSA manufacturers could not keep up with demand. Many built larger factories, hired more qualified workers, and spend millions to create more and better designs. Component manufacturers also kept a steady drumbeat of sought-after instruments, accessories, parts, and add-on features. Those were exciting years for LSA. Then the "Great Recession" hit hard. Industries far beyond aviation were pummeled and government officials spoke of a banking collapse. Sales declined (see nearby chart) and LSA manufacturers scrambled to adjust. Many lost money as they had built too much capacity right about the time demand slacked. As you can see, it was even worse for GA and bizjet makers but it was hard on the LSA industry. So, manufacturers got small, the only defensive posture they could take as these are not deep pocket companies. The recession supposedly ended in 2009, though many will tell you their lives haven't improved much. Unemployment remains high; the U.S. labor force is smaller than it was in 2000 despite 30 million more population. The stock market has recovered, but household income has only risen marginally. Interest rates are held near zero by Federal Reserve policies but loans remain hard to get for small companies. LSA producers had no choice but to adjust. Another factor emerging since 2006 is increased regulatory burden, in the USA and other countries, contributing to more effort needed by manufacturers to demonstrate compliance and meet added rules placed on them. At the same time new technologies such as glass panels, autopilots, and more complex engines have demanded more from producers. Add these requirements to a difficult economy and you have ample explanation why manufacturers are not building airplanes as fast as they once were. The good news: LSA are better airplanes than ever. Plus, new designs continue to emerge and most LSA builders remain in business, albeit with smaller operations. The industry is leaner but still active. However, all these factors translate in 2013 to longer delivery times. Some aircraft builders, like Aerotrek and Phoenix Air, never went overboard to build as many airplanes and both those companies have maintained steady businesses with deliveries stretching into 2014. Producers who made many more airplanes are still building but in more cautious volumes. So, when demand finally began rising as it did early in 2013, orders were written and deposits made, but airplanes were in the supply line and not available to be registered. Hence, 2013 registration numbers are soft. As demand and supply find equilibrium, delivery times will come down and registrations will rise. We may not see the manufacturing pace of 2006 for some time but I remain absolutely convinced that LSA and SP-eligible kits and aircraft are the new entry point in aviation. Plus, remember LSA are a worldwide phenomenon. Prices range from less than $40,000 to more than $200,000 but consider that a new Cessna 172 Skyhawk will sell for nearly $400,000 in 2014. That venerable design will still be a 1950/60s design, where modern LSA have many qualities to support a still-strong interest in flying. Will 2014 be a year of much improved results? I don't know. My crystal ball is no better than yours. Yet I know this. We have many terrific airplanes and more are on the way. We still have, by far, the least costly pilot certificate and no medical is needed. Our airplanes burn much less fuel and most work great on mogas. We've got great engines, panels, and comfortable cockpits. In addition, this: people still want to fly their own airplane. To gain a fresh perspective, what better way than to go aloft and see at this beautiful planet or examine your own neighborhood from above. Flying remains a very special activity and we should celebrate how easily and affordably we can pursue it. Light-Sport Aircraft make this possible for more people and that value will only get stronger. A number of you have asked about an updated sales report for 2013. While remembering that we report registrations not sales, this year has been a different sort. Registrations are down from 2012, with the exception that CubCrafters remains the registration (and presumably sales) leader. American Legend and their Cubs are also showing more activity than previous years. Beyond the yellow taildragger squadron, it’s something of a mixed bag. More on that below. &#149•• Let me offer you another statistic that amazes me while speaking to ever-growing interest in Light-Sport Aircraft and light kit aircraft that Sport Pilots may fly. In September, ByDanJohnson.com set an all-time record with 71,400 Unique Visitors, 25% higher than our previous record (July 2013). In 2013, Unique Visitors have averaged more than 35,000 per month, a figure more than double 2012, which had been our best year ever. If I appear to be bragging too loudly, let me say that I believe this website is merely the messenger and that it is a fleet of great LSA and a solid team of suppliers and service providers that is delivering visitor growth. At the Midwest LSA Expo that concluded a few days back, I delivered a presentation called "20+ Reasons to Buy an LSA." However, to handle the subject a little bit differently, I turned it into an audience participation exercise. As I presented each slide of one particular reason, I explained what was meant and elaborated on how each reason made LSA different from other sorts of aircraft someone might consider buying. Then, I asked the audience to raise their hand if that reason was one that might cause them to buy a Light-Sport. I advised that no one was recording their names, so they remained anonymous. Each person could raise their hand as many times as they wanted or never raise their hand if they chose. No one had to participate. About 35 people listened and somewhere between 15 and 25 answered most of the time. The following chart shows the responses. The sample size isn't large enough to be scientific, but I bet manufacturers and sellers will pay attention. To make the chart easier to comprehend, I changed the order of reasons to reflect those that provide the most compelling reasons to buy. You can see that number one was fuel efficiency. This result must be satisfying to Rotax engineers and salesmen because that company's new fuel injected 912 iS engine boasts a considerably better fuel burn rate than the carburetor version (912 ULS) that preceded it and which is still available. I'll have more about Rotax's 912 iS in a following post. Three reasons tied for second place: the spaciousness of LSA cockpits; the rapid pace at which manufacturers can introduce new designs or technology (thanks to the ASTM standards method of obtaining FAA acceptance); and, not surprisingly, the sheer joy of flying these responsive, good performing, roomy, fuel-sipping aircraft. A large share were motivated by the chance for LSA owners to do their own annual condition inspection (after a 16-hour weekend course) or full maintenance (after a monthlong course). A three-way tie for fourth included: the huge visibility many of these aircraft offer (I told listeners that the view from aloft was my main reason to enjoy flying); their solid safety record as established after more than eight years of owner operation; and, the generous payloads they offer both as a share of their gross weight and compared to many GA aircraft. The arrow shows the most popular reasons answered by more than half the participants, but you can see that all the other reasons also have their adherents. You'd have to hear the hourlong presentation to know precisely what the other reasons mean, but their titles are fairly self-explanatory. Notably, flat last, with about a third of respondents, was the low noise output of most LSA. Of course, that's something more important for folks on the ground and my audience at the Midwest LSA Expo wanted to fly. Indeed, that's a leading reason to attend the fall event in Mt. Vernon, Illinois. Demo flights don't get much easier to deliver than at this flying-friendly airport. A special thanks to Jacob Peed, director of Aviators Hot Line for tallying the responses as I presented. Aviators and ByDanJohnson.com plan a further effort of surveying these questions as a means to help buyers and sellers achieve their goals. At the Midwest LSA Expo that concluded a few days back, I delivered a presentation called “20+ Reasons to Buy an LSA.” However, to handle the subject a little bit differently, I turned it into an audience participation exercise. As I presented each slide of one particular reason, I explained what was meant and elaborated on how each reason made LSA different from other sorts of aircraft someone might consider buying. Then, I asked the audience to raise their hand if that reason was one that might cause them to buy a Light-Sport. I advised that no one was recording their names, so they remained anonymous. Each person could raise their hand as many times as they wanted or never raise their hand if they chose. No one had to participate. About 35 people listened and somewhere between 15 and 25 answered most of the time. The following chart shows the responses. Our annual review of LSA Market Share brings our updated fleet chart and a second chart showing prior-year registrations. While sales of new SLSA remains below par, the market appears to be experiencing spotty but regular recovery from earlier low points. The first half the year foretold a better recovery but the last half of the year stalled somewhat. Regardless, based on traffic to this website, LSA interest is higher than ever. For January 2013, ByDanJohnson.com set all-time records in Unique Visitors and all other measuring criteria Thank you for your support! 2012 Market Share report — Nearby, we present our standard market share numbers. Our original chart remains consistent, illustrating the "installed base," or "fleet size." Because we know many of you seek recent-year information we are repeating the Calendar Year chart that debuted last year. For the second year in a row Cessna lead in 2012 with an impressive 94 registrations though this is down 30% from 134 in 2011. While Cessna looked to set a new record with 76 registrations (152 annualized) in the first half of 2012, their pace slowed sharply in the second half, adding only 23, perhaps a result of their announcement about switching to Primary Category as a means of entering the European market. The Wichita giant is singlehandedly restarting Primary Category with the first such application in nearly 20 years, a decision that may inspire other companies to go this route. Perhaps the most noteworthy story in 2012 registrations is an even better performance by CubCrafters. The Washington State company added 48 new registrations, up 33% from 36 in 2011. Company marketing boss John Whitish reported 52 SLSA sales, which prompts us to ask that you read the notice at the end of this article. Congratulations to CubCrafters, clearly a company to keep watching. A remarkably steady climber is Aerotrek, which took the #3 slot for 2012 registrations, a notable improvement from their #5 spot in 2011. Despite some reports that all SLSA are expensive, Aerotrek has a very attractive price point and an impressively built, folding wing aircraft available in tailwheel or trigear. Aerotrek consistently replies to our listings, with the goal of making our FAA registrations report more precise. This happens, for example, when sales occur to Canada with no N-number assigned or when a SLSA drops down to ELSA perhaps as the owner wants to make design changes (which is allowed as is owner maintenance). Other companies also see differences explained by deregistration, accidents that remove the aircraft from the registry, or simple errors in data entry after a sale. Regardless of the variables in counting registrations versus sales, bravo to Aerotrek! Based on their faithful feedback we have been able to improve our accuracy. Other top guns in 2012 include perennial leaders like Flight Design, which remains convincingly atop the overall fleet and added 11 more registrations during the year and American Legend which revived from a sluggish 2011 to add 11 SLSA in 2012. SportCruiser importer US Sport Aircraft fulfilled the last of the PiperSport orders and rewrote their distributor agreement with Czech Sport Aircraft; they added another 10 SLSA in 2012. In a pleasant but unexpected turn, importer Phoenix Air USA added an impressive 10 SLSA registrations of their extremely lovely motorglider. Congratulations to all these leaders. A member of the exclusive Over-100 Club listing only eight SLSA producers is Tecnam. The Italian company showed renewed vigor logging six registrations in the second half of the year. They also successfully completed an FAA audit in Italy. Among their five SLSA models, four are high-wing models yet their low wing Sierra has 51 units flying in America, more than any other Tecnam model. Another European producer with facilities in Italy is Pipistrel, which overcame regulatory hurdles in mid-year and has begun delivering SLSA to Americans. They also logged six in the last half of the year. Both Tecnam and Pipistrel report active sales outside the USA. Unfortunately, one former high flyer, Remos, lost its U.S representative and has become very quiet though earlier this year, their CEO said they had recovered from the previous CEO's high-spending ways. We are watching a few companies not on our fleet chart. One new entry to the SLSA scene is Bristell, in a new partnership with fractional ownership provider, AAP. They join some other companies that have not been active long enough to get on the fleet chart, but nonetheless deserve attention. These companies include World Aircraft Co., which is bringing all production to their Paris, Tennessee facility. Breezer is now established on the Sun 'n Fun campus and more is expected from them. Sky Arrow producer Magnaghi has new life and may resurge. Aero's AT-4 (formerly known as Gobosh) is back with new representation. Just Aircraft got rave reviews on their SuperSTOL model and this mostly kit company is enjoying a solid run of business something like 100% kit producers Zenith Aircraft and Sonex. While mentioning kit builders (not on our SLSA list), we must include Van's Aircraft, which has seen registration of 203 RV-12 kits. We are also watching the pulse on seaplanes lead this year by Progressive Aerodyne, which earned SLSA approval even as FAA increased their oversight via highly detailed audits. Congratulations to the SeaRey team for this significant accomplishment. This brief look at the LSA market is not complete. One observation is that the "All other producers" category is now the largest percentage, indicating small producers continue to develop sales. Some companies not reflected in our Top-20 and Top-10 charts may emerge into these lists in the future. Others that have been in the Top-20 but which are no longer producing new aircraft were omitted. However, all SLSA models are covered in our SPLOG reports and you may also examine our Featured Aircraft (right column of most pages) for more exciting Light-Sport Aircraft and other aircraft Sport Pilots can fly. As I have said for years, a loud shout-out is owed to Jan Fridrich of the Czech LAA for the LSA Market Share report. Jan is also head of LAMA Europe and a tireless worker for the advancement of Light-Sport aviation. He invests many hours to analyze data for each report. Thanks, Jan, on behalf of all ByDanJohnson.com readers. During 2013, we will work to solicit comments from producers to evaluate the sales versus registration numbers. This is not an easy task and no promises are made yet the effort seems worthwhile in the pursuit of better information. Notice: As always, we observe for you that all numbers here are derived from FAA's N-number registration database and are subject to data entry errors. Figures presented are not identical to sales recorded by the companies though over time the numbers draw closer. UPDATE 2/13/13: GAMA held a press conference today where they released their industry numbers. 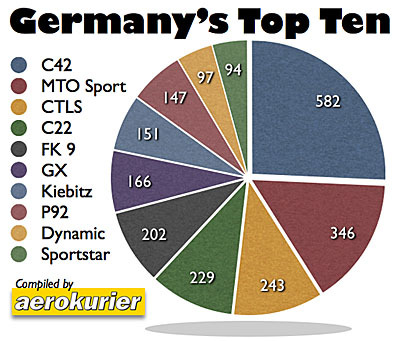 Get more on GAMA here, but this is where their figures relate to the Light-Sport market. Piston aircraft, singles and twins, suffered a minor drop, only 1.9% down; GAMA did list some LSA in their report but did not use them in summary tables. Turbines were up and GAMA added agricultural crop-spraying planes to their membership; many ag planes are turbine powered. Jets were down slightly more at minus 3.4%. Like the Light-Sport industry, GAMA is hoping for improvement in 2013 and they announced some interesting initiatives to this end. Our annual review of LSA Market Share brings our updated fleet chart and a second chart showing prior-year registrations. While sales of new SLSA remains below par, the market appears to be experiencing spotty but regular recovery from earlier low points. The first half the year foretold a better recovery but the last half of the year stalled somewhat. Regardless, based on traffic to this website, LSA interest is higher than ever. For January 2013, ByDanJohnson.com set all-time records in Unique Visitors and all other measuring criteria Thank you for your support! 2012 Market Share report — Nearby, we present our standard market share numbers. Our original chart remains consistent, illustrating the “installed base,” or “fleet size.” Because we know many of you seek recent-year information we are repeating the Calendar Year chart that debuted last year. For the second year in a row Cessna lead in 2012 with an impressive 94 registrations though this is down 30% from 134 in 2011. BRM Aero's Bristell appears to be an up-and-comer. Jim Lee has quietly been logging a slew of orders for his smooth motorglider. Aerotrek continues to be a solid selling aircraft, and offers one of the lower price points among LSA. We've been getting requests for market share information and I am happy to provide an update, thanks to my European associate Jan Fridrich who does the hard work of sifting through FAA's database. I remind you that his efforts are not merely tallying whatever FAA publishes. In fairness, Jan has to evaluate many pieces of information and judge accuracy of the entries. This isn't because FAA's registrars are bumbling fools that cannot enter data accurately. The challenges come from sheer number of brands (90) and models (127) over a mere seven years... unprecedented in aviation history. To that add the variations of Experimental Amateur Built (EAB), Special Light-Sport Aircraft (SLSA), Experimental Light-Sport Aircraft kits (ELSA) and converted two-place ultralights to LSA status. Then factor in that some standard category or homebuilt aircraft meet the LSA parameters of weight and speed and such so some people consider them "LSA," when in fact they mean they can be flown by some possessing a Sport Pilot certificate. My onetime EAA associate Ron Wagner coined the phrase "Sport Pilot eligible" to describe these aircraft. So now we come to the first half of 2012. Cessna appears the clear and away winner of the registration sweepstakes with an impressive 71 registered aircraft logged in six months (11.8/month). Jan reports a good number of these are registered in Cessna's corporate name so they do not equate to deliveries though they are newly hatched LSA. In all of 2011 Cessna registered 11.2/month so Shenyang Aircraft in China is finding a steady pace of production. Following well behind but still leading the rest of the pack is CubCrafters with 28 more registrations in the first half (4.7/month), a faster pace than their 2011 performance of 36 (3.0/month), indeed greater than 50% more production than last year when they also came in second after Cessna. American Legend managed to slightly up their 2011 pace to register seven new LSA in the first six months of 2012, trailed by Flight Design with six, followed by a tie between Jabiru U.S. and SportCruiser at five each. One surprise is Phoenix, the sleek motorglider builder, whose U.S. importer registered four in 2012 but reports having sold 20. "We cannot keep up with orders from customers," Jim Lee reports, "even though the production rate has increased." Bristell registered three and was followed by a chain of companies registering two apiece: Arion and their Lightning, Renegade and their Falcon, World Aircraft and their Spirit, and Canadian Light Aircraft and their Bush Caddy. Quite a few more companies at least got on the log and I think it's fair to say the first half of 2012 represents an improvement over 2011. That's great and we'll hope for more progress in the Light-Sport Aircraft sector. Update 9/5/12 — Shortly after we released the nearby chart, we heard from Aerotrek that we had undercounted their registrations. Besides our regrets — we do strive for accuracy — we repeat the comment that FAA's database can be a confusing place. Aerotrek's Rob Rollison sent detailed information to support his registration of six new LSA (the earlier report was for two) in the first half of 2012. He reported three each of the A240 tricycle gear models and A220 taildragger models were registered. Aerotrek continues to enjoy positive developments. In defending his registrations, Rob wrote, "Every plane I receive from [manufacturer] Aeropro is already sold — we are sold-out eight months in advance at the present time (and it's been this way for over a year)." Contratulations to Aerotrek and Aeropro. We looked into the data more deeply and corrected the chart. DISCLAIMER: As always we remind readers that the information presented in the text above and in the nearby graph is derived from registrations as logged by FAA Registration Branch. Figures are not sales or deliveries though over time, these values will tend to be very close. Also, the registration database used for this report may no longer include aircraft that were removed from the registry, slightly altering the numbers. Such removals can occur when an aircraft is shipped out of the USA, is destroyed by an accident, or is taken from Special LSA category to another category like Experimental LSA. Every effort has been made to report the most accurate information available. We’ve been getting requests for market share information and I am happy to provide an update, thanks to my European associate Jan Fridrich who does the hard work of sifting through FAA’s database. I remind you that his efforts are not merely tallying whatever FAA publishes. In fairness, Jan has to evaluate many pieces of information and judge accuracy of the entries. This isn’t because FAA’s registrars are bumbling fools that cannot enter data accurately. The challenges come from sheer number of brands (90) and models (127) over a mere seven years… unprecedented in aviation history. To that add the variations of Experimental Amateur Built (EAB), Special Light-Sport Aircraft (SLSA), Experimental Light-Sport Aircraft kits (ELSA) and converted two-place ultralights to LSA status. Then factor in that some standard category or homebuilt aircraft meet the LSA parameters of weight and speed and such so some people consider them “LSA,” when in fact they mean they can be flown by some possessing a Sport Pilot certificate. Read More About: Aeropro Aerotrek A220 Aerotrek A240 Aerotrek Aircraft Bristell Bristell (NG 5) SLSA BRM Aero, s.r.o. LSA Market Shares Phoenix Phoenix Air s.r.o. LSA are proliferating all around the planet. We try not to overdo this, but we have a new benchmark to share with you. *** One year ago, we loaded a new graphic onto our home page. The idea was to better identify where in the world we were finding visitors so we put up Flag Counter, which you can see at the bottom of the Featured Aircraft listing in the right column. It's been fun to watch the numbers and flags adjust. *** If you click on that image you can get much more info. One thing you'll see is that we've had 191 countries come to visit, including some you may not know existed. 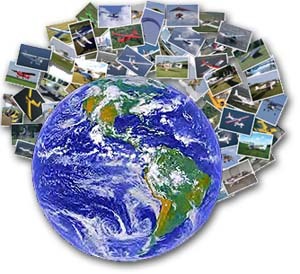 Indeed, the entire world has an interest in affordable, recreational aircraft. *** You'll also note a count of Unique Visitors. At the end of the first year of having this counter on ByDanJohnson.com, we exceeded 150,000 Unique Visitors, according to Flag Counter. Our own stats counter — which doesn't simply sample as most other counters do, instead counting every visit — shows an even larger number: 181,846 or more than 15,150 per month. In 2012, our all-time record year, the average has exceeded 16,000 Unique Visitors per month. We feel mighty fortunate about our steady growth since everyone knows too well we have a sluggish economy most places on the planet. *** In August of 2012, we exceeded 3 million hits for the first time, and our bandwidth showed nearly 60 GB of content delivered. That's more than 12 DVDs worth or 75 CDs full... every month. Our sponsors — who help us make so much available for free — care how many times their banners and messages are being seen and we have consistently over-delivered on that promise as well. Oh, BTW, our August revenues also set a record and we sincerely thank our many sponsors for their unwavering support that benefits every reader. *** All this is just numbers and we hesitate to wave our flag too vigorously as it sounds like bragging. OK, it is a bit, but the larger, more important message is that the idea of affordable aircraft and flying for fun appears — at least by the benchmark of one website's performance — to be alive and well... all over the globe. 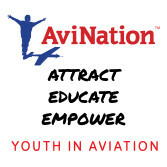 *** Of course, the big aviation websites like those from AOPA, EAA, AvWeb, ANN, and many others have even larger numbers of visitors but they often include aviators interested in working or business aircraft. Instead, we offer the sporting community of aviators a concentrated package: all fun flying and no business or transport aircraft content. *** We enjoy what we do here at ByDanJohnson.com and we hope it shows. We're lucky to have top-notch contributors that add depth. We CERTAINLY appreciate your regular, growing visits and we promise to work hard every single day to keep providing the news, videos, and other information you seek. Thanks so much for clicking by for a visit! C'mon back soon. We try not to overdo this, but we have a new benchmark to share with you. *** One year ago, we loaded a new graphic onto our home page. The idea was to better identify where in the world we were finding visitors so we put up Flag Counter, which you can see at the bottom of the Featured Aircraft listing in the right column. It’s been fun to watch the numbers and flags adjust. *** If you click on that image you can get much more info. One thing you’ll see is that we’ve had 191 countries come to visit, including some you may not know existed. Indeed, the entire world has an interest in affordable, recreational aircraft. *** You’ll also note a count of Unique Visitors. At the end of the first year of having this counter on ByDanJohnson.com, we exceeded 150,000 Unique Visitors, according to Flag Counter. Our own stats counter — which doesn’t simply sample as most other counters do, instead counting every visit — shows an even larger number: 181,846 or more than 15,150 per month. Rotax BRP's more fuel efficient 912 iS. 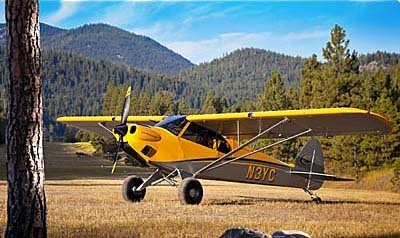 Cessna's Skycatcher lead 2011 registrations among LSA followed by CubCrafters. 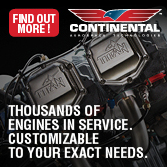 Flight Design's CT series maintains the largest fleet of LSA. FAA issued its 20-year forecast for aviation showing growth prospects for business jets and Light-Sport Aircraft. It also forecasts a decline in the total number of piston-powered aircraft. Viewed from a distance, this might seem beneficial to Light-Sport Aircraft producers and sellers. Reasonably, FAA's report appears to suggest recreational pilots will enjoy more hours aloft in a growing fleet of LSA. *** Against a backdrop of what seems to be continuously increasing prices for avgas — some believe 100LL might even disappear — the fuel efficiency of LSA becomes more important. For example, Rotax just launched their 912 iS fuel-injected engine boasting a 21% reduction in fuel consumption, taking the popular engine from burning about five gallons per hour to a theoretical four gallons in an hour of flying. Should we LSA enthusiasts celebrate these facts? *** Regretfully, I find FAA's forecast improbable (see details below). Not that the agency's number crunchers are wrong; in fact, I hope they might be right. I simply find a 20-year forecast for an industry only seven years old to be a form of spreadsheet-based palm reading. *** Forecasting the future is barely more than informed guessing... by anyone, whether FAA, stock market forecasters, or climate predictors. Foretelling the future commonly relies on historical perspectives that are often upended by new developments, whether technical innovations on the plus side or terror attacks on the minus side. Innumerable events conspire to render even the most thoughtful forecast totally incorrect. *** That said, here are a few more tidbits gleaned from a study of FAA's spreadsheets: ••• Certified single engine piston airplanes (other than LSA) are forecast to decline from 148,101 when LSA arrived on the scene in 2005 to 135,340 by 2032. This 12,761 drop amounts to about 500 aircraft per year being retired from the fleet. ••• Experimentals are expected to grow by 32% over this 26-year period (which includes a few years already confirmed: 2005 to 2010) to 31,140 aircraft. This calculates to adding about 289 Experimentals per year throughout that period. 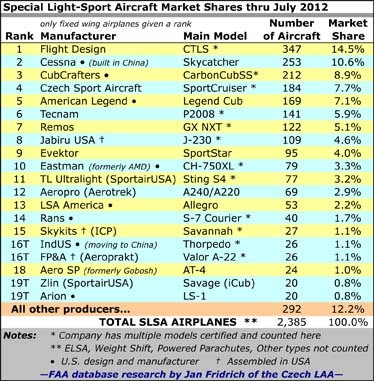 ••• "Sport Aircraft," a category I presume includes LSA, is expected to expand from 6,528 in 2010 to 10,195 in 2032. Of the 6,528 in the most recent count, some 4,000 are evidently ultralights converted to ELSA. Those won't be repeating, so it seems FAA is forecasting growth of new SLSA at 3,667 aircraft over a 20-year window, or about 183 aircraft per year. Since the LSA industry has every year produced more than 183 aircraft — some years twice that or more — FAA's forecast is questionable to me. ••• Interestingly, when you add the growth in Experimentals to the projected growth in LSA you get almost exactly a 1:1 replacement for those departing FAA-certified single engine aircraft. Thus, in FAA's crystal ball, the overall fleet of single engine flying machines will flat line over the next two decades. ••• FAA predicts meaningful growth in pilot certificates only for Sport Pilot and Rotorcraft pilots. Growth of Sport Pilot certificates is by far the highest in percentage terms, though the recent starting date skews the data. Despite this statistical anomaly, I find Sport Pilot growth reasonable given that this new certificate — like the LSA themselves — represents the new entry point for pilot starts. Why pay for a Private when you can get an FAA license for half the cost? *** In summary, the FAA effort is worthwhile and appreciated, but honestly, I would not bet these figures are reliable given the distant horizon. The only way to know for sure? Check back in 20 years. To compare FAA's significantly different forecast from only two years ago, read this report. FAA issued its 20-year forecast for aviation showing growth prospects for business jets and Light-Sport Aircraft. It also forecasts a decline in the total number of piston-powered aircraft. Viewed from a distance, this might seem beneficial to Light-Sport Aircraft producers and sellers. Reasonably, FAA’s report appears to suggest recreational pilots will enjoy more hours aloft in a growing fleet of LSA. *** Against a backdrop of what seems to be continuously increasing prices for avgas — some believe 100LL might even disappear — the fuel efficiency of LSA becomes more important. 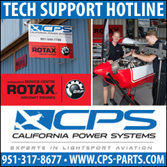 For example, Rotax just launched their 912 iS fuel-injected engine boasting a 21% reduction in fuel consumption, taking the popular engine from burning about five gallons per hour to a theoretical four gallons in an hour of flying. Should we LSA enthusiasts celebrate these facts? *** Regretfully, I find FAA’s forecast improbable (see details below). Not that the agency’s number crunchers are wrong; in fact, I hope they might be right.